Mama Bear is in a hurry to get the day started and get things done. Bella Bear is not really worried about going anywhere. She wants to play. After all the rushing around, Mama Bear is stopped by traffic, so she decides to spend some quality time with Bella. By the end of the book, Mama Bear is singing a different tune. 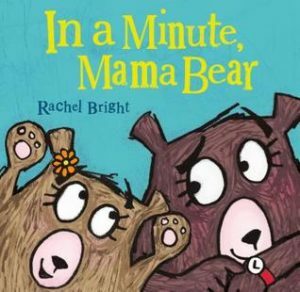 My classes that read this book with me all enjoyed that Mama Bear was the one saying, “In a minute. . .” to Bella Bear at the end. Cleverly written with rhyme and rhythm. Good book!